DAVID BOWIE: BEST OF BOWIE: 5 STARS OUT OF 5 STARS: 34 songs on 2 cd’s. 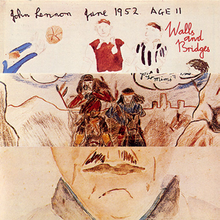 JOHN LENNON: WALLS AND BRIDGES: 1974: 4 STARS OUT OF 5 STARS: John Lennon’s last solo album of all new material written by John [except for the last song Ya Ya} The next year he’d do the covers album Rock N Roll then before his death the album with Yoko. Two hits on this- and they were great singles- “Whatever Gets You Thru The Night” and #9 Dream. This is an album that I believe sounds better with age than it did at the time of release when it received very mixed reviews. The album did go to #1 on the Billboard album chart and “Whatever Gets You Thru The Night” was the only #1 solo hit he would have during his lifetime. Can’t go wrong with the Bowie album… I’ve always liked #9 Dream off of Walls and Bridges.